Chief Automotive Technologies’ new PNP90 self-piercing rivet gun is ideal for all common auto body riveting applications, including efficiently bonding aluminum and steel vehicle body panels. It’s part of Chief’s product line expansion to include “fusion” products shops need to properly repair collision-damaged vehicles. In addition to the rivet gun, the fusion group includes a full line of welders that had previously been marketed under the Elektron brand. “Rivets offer an ideal solution for bonding two different metals together, and their place in the collision repair process will continue to grow as automakers increasingly mix aluminum with steel in new vehicle construction,” says Rob Elliott, lead engineer, collision and controls, for Chief parent company Vehicle Service Group (VSG). The new rivet gun features a pneumatic-hydraulic design that offers improved consistency over battery-operated riveting systems. While today’s battery-operated rivet guns may get the job done, their power drains throughout the course of the repair. By utilizing air and hydraulics, Chief’s gun is able to drive the last rivet of the day as hard and as fast as the first. This consistent performance helps technicians properly complete repairs in record time. The PNP90 gun’s riveting power comes from a pneumatically-driven, hydraulic pressure intensifier. The intensifier converts air pressure of 87 psi (6 bar) from a standard air compressor to 8,702 psi (600 bar) hydraulic pressure at the rivet gun tip. Quick-connect couplings provide a fast and easy connection to the rivet gun actuator or optional blind rivet actuator. As new applications are developed, users will be able to upgrade the PNP90 gun with additional actuators. This modular design allows the PNP90 gun to evolve with the industry. The Chief rivet gun is easy to use. 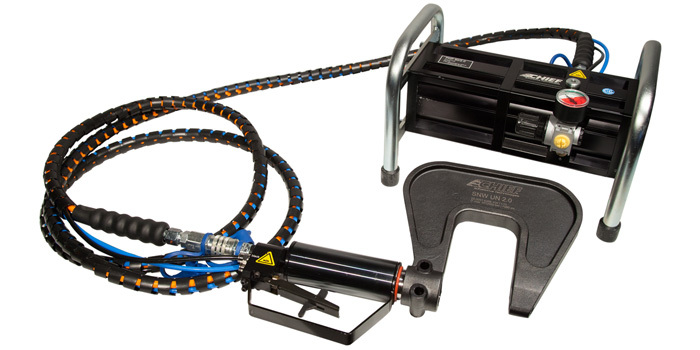 To begin riveting, the technician simply connects the gun to the pressure intensifier via a hydraulic hose. Since there is no battery in its base, the rivet gun is significantly lighter than battery-operated models, which can weigh more than 10 lbs. each. This makes the Chief rivet gun easier to maneuver in tight spaces and move from one rivet to the next. The Chief gun applies self-piercing rivets for maximum efficiency. The optional blind rivet actuator enables the gun to apply blind rivets, which are required for some repairs on today’s vehicles. Chief’s PNP90 rivet gun comes with a rivet clamp and interchangeable attachments for setting and extracting rivets. Additional clamps are available, enabling users to adapt the gun to various applications. All components fit in an included carrying case for easy transport throughout the shop.